(PhysOrg.com) -- Traffic congestion is not only annoying, its expensive. In 2005, traffic congestion cost an estimated $78.2 billion in 437 urban areas in the US, according to the Texas Transportation Institutes 2007 Urban Mobility Report. The cost is measured by the travel time index, which is the ratio of travel time in rush hours to travel time at quiet periods, and has increased from 1.09 in 1982 to 1.26 in 2005. In addition to the use of public transportation and bicycle commuting to address this problem, some researchers have been developing intelligent transportation systems in which vehicles use near-real-time traffic data to choose the fastest route and decrease congestion throughout the network. However, there has been some debate on whether or not these high-tech systems actually work  that is, whether or not they minimize the overall average travel time of all vehicles in a traffic network. Some studies during the past several decades have shown that even having perfect traffic information does not guarantee lower congestion. In one model, a traffic network in which every vehicle had full information of the roads had the same overall performance as a traffic network with no information feedback. Now a new study shows that navigation systems in which vehicles collect and share traffic information with each other can decrease the average travel time of all vehicles in a traffic network. In contrast to some of the previous studies that found the opposite result, this study dealt with a fully decentralized, crowd-sourced system rather than sensors located at specific road locations, and also tested the system using real-life experiments and simulations of more complex, realistic traffic flows compared with the simpler models in previous studies. The researchers, Ilias Leontiadis from the University of Cambridge and coauthors from there, the University of Bologna, and the University of California, Los Angeles, will have their study published in an upcoming issue of IEEE Transactions on Intelligent Transportation Systems. First, the researchers designed a smart navigation system called CATE (Computer-Assisted Traveling Environment). In CATE, every vehicle acts as a traffic sensor by sending traffic data every time it exits a road segment, which is typically at an intersection. The data, which includes the intersection, the time the vehicle entered the road segment, and the time the vehicle exited the road segment, gets sent to other vehicles via a wireless network. As demonstrated by experiments at UCLAs Campus Vehicular Testbed (C-VeT), the low data rates that the technology requires can easily be supported by the bandwidth used by personal wireless devices, such as GPS systems or smart phones. Next the researchers compared different algorithms that these devices might use to choose the best route based on the traffic information they receive. 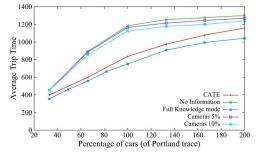 Using computer simulations as well as traffic data collected in downtown Portland, Oregon, the researchers found that, with the best algorithms, 64% of vehicles reduced their travel time by more than 10%. Of the rest, 23% had trip times within 10% of their times without the information (and so were considered to not really be affected), and the remaining 13% required more time than without the information. The researchers attribute the increased time to the fact that some traffic was being diverted into relatively open roads that consequently became busier than before. Still, the overall average trip time was significantly reduced when the CATE navigation system was used. The researchers also found that, when just 34% of the vehicles used CATE, the performance of the entire traffic network was comparable to the performance when up to 100% of the vehicles used the system. Part of the reason for the positive results of the evaluation is due to the way that CATE works compared with other navigation systems, such as video cameras or induction loops that monitor select street locations. With these latter systems, all vehicles can instantly access the same information using cellular networks or FM radio stations. However, not all streets are monitored, which can cause unknown congestion in these areas. In contrast, all streets with vehicles that use CATE are monitored, so vehicles do not congest streets due to lack of information. Also, all vehicles have a slightly different perspective of the traffic conditions, which may lead to more individualized routes. Leontiadis explained that one of the surprising results was how quickly and effectively information could spread among vehicles. By showing that a decentralized intelligent transportation system can greatly improve traffic flow, the results of the study could lead to significant economic savings. The study also opens up new research directions, such as investigating the impact of different algorithms and flow intensities on the average travel time. Other areas for improvement include better algorithms, ways to lower bandwidth, and data encryption for security issues. What happens when you drive through a tunnel? Or if you're out of town? This seems dangerous to me. Indeed, I can see where some concern might be caused. If the system were hacked or by some natural event compromised, erroneous data could cause severe congestion, but not harm. That is, unless one wanted a large number of cars to congregate in order to impede say, fighting a fire, or some law enforcement action. In the event of car theft..this system could be a GREAT help to law enforcement/you and me. Where I live, and in many places, cell phone coverage does not fail when driving through a tunnel. The main reason for this kind of aggressive coverage is, primarily, to deal with car fires inside the tunnels - very messy! If you are out of town, your car is at home, problem solved. If your car is with you, we may assume, that you and I are not the only people with working cellphones/CATE. Very nice. The closer some system like this gets to actual use, the better. I like this because it seems to need no new hardware. If the system is truly decentralized, how is it possible for one car to recieve data from a million cars in the same area over the GSM network? There must be a central server to handle data requests, because a car doesn't know which other cars know what the conditions are like where it is heading, and so it would have to ask every car in the area. That would quickly saturate the limited bandwidth of a GSM link. And with a central data processing system, privacy becomes an issue because a malicious agent can easily monitor where everyone is, and who everyone are. the graph shows diminishing returns as the number of cars increases? so in a city like new york/la this would be completely useless? This process was developed and installed in a project called TravTek in the early 90's. (Search IEEE for TravTek.) 100 GM cars for a year were rented by Avis and the vehicles provided the travel time on each road to a central system that rebroadcast the times. The central system also gathered data from other sources. The navigation system in each car used this real-time data to change the routing. The system was independently evaluated against controls and found to provide delay reduction to the vehicles with the equipment. No reason it needs to be GSM. Think P2P. Individual requests for data aren't necessary. Each car can just continually broadcast their data, say every 10 seconds or so. Each one receives the broadcasts. If you're receiving all the data from the cars around you, you'll have data from everywhere they've been in say the last 30 minutes or so. They can also merge their collected data with data they've received from other cars and you'll be receiving that too. Your car will then merge that with what it already knows and rebroadcast. Measures can be put in place to make that difficult. For example, there's probably no need for each car to broadcast their device ID, so the data isn't necessarily identifiable to a single car. Of course, if there are few cars on the road, one could figure out which car transmitted data and probably get an idea of where they've been, but it'd be difficult to determine if the data that car is transmitting is just from its own travels or data that was merged with other cars it's been near recently. Obviously, there'd be an "off" switch, so the cheating husband can turn it off on his way to his mistresses apt. and, of course, assuming he doesn't have that so called, "Progressive" insurance with their GPS data logger to monitor his driving activities. Ooooh, I can see ways of hacking this sooo easily. Get a bunch of old cars, remove their sensors/sending-devices and bury them at the roadside of the route of your choice. Now the system will think that there is a traffic jam there and will continually reroute all other traffic - and you can have the freeway all to yourself. What I wouldn't pay for something like this on monday mornings. But all joking aside: Not a bad idea. Navigation systems with congestion warnings are already out there - but they just lead to everyone leaving the highway at the same time (congesting the bypass). a smart P2P network could optimize the flow much better. I'm more interested in what simple behavioral changes could do. The US has given the false impression that slow is efficient. The reality is that quick acceleration not only uses less fuel, it increases throughput at bottlenecks. When people ride in driverless cars, one of the first things they notice is how fast they accelerate (because it is more effient). How much participation is needed for quicker acceleration to have an impact on congestion? Consider putting extra lights on the lead in roads that indicate highway A is less choked than B. Drivers simply assemble into a specially designated lane allow themselves to be switched by the traffic management system that has an overall view. Each car can just continually broadcast their data, say every 10 seconds or so. Each one receives the broadcasts. Each car would need a certain time to send over the same channel that everybody listens to. They would have to organize not to shout over each other, and it would still be impossible when the number of cars increases to millions, because the transmit window would shrink to nothing. Think of a situation when everybody in a city decides to send a text message at roughly the same time. Plus, every car would need to hold and process all the data, which may require significant computing power and memory. "Each car can just continually broadcast their data, say every 10 seconds or so. Each one receives the broadcasts." Not only would you have to worry about the transmit window as Eikka says, but you'd also have to have a fairly high transmit power (and/or use valuable lower-frequency spectrum) in order to get sufficient broadcast distance for the information to be useful for people to make route choices which might need to be made many miles in advance. Using the cell data networks already in place makes much more sense, especially since the internet would allow that data to be sent more or less anonymously,for instance using UDP packets with a fake sender IP address. Or, if you're just really paranoid, set your phone up to send the data through Tor.